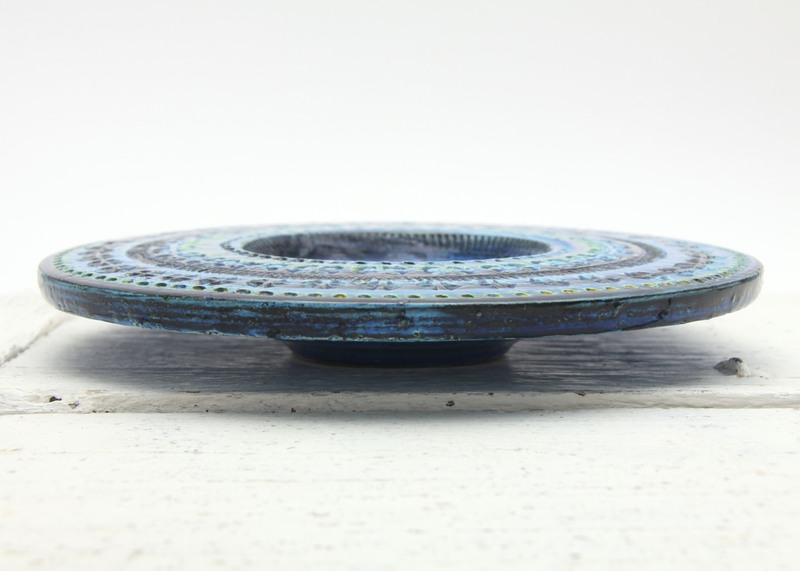 This is a Fantastic ‘Rimini Blu’ bowl / dish / wall plaque, by Bitossi Ceramiche, Italy circa 1960’s. 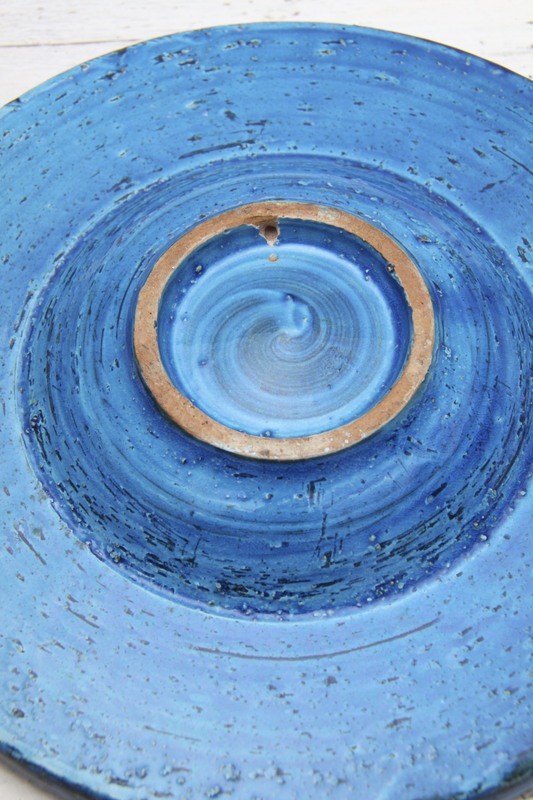 A Striking form, the wide flat rimmed circular bowl has a hemispherical well in the middle. Decorative and sculptural, could be used as part of a table arrangement, as a candleholder, on a desk, or can be hung as a wall plaque. A Fabulous design by Aldo Londi from 1959, in the striking iconic ‘Rimini Blu’, With its alternating bands of impressed motifs resembling Arabesque or Runic patterns, it is influenced by the new trends in art and design in the mid century period. 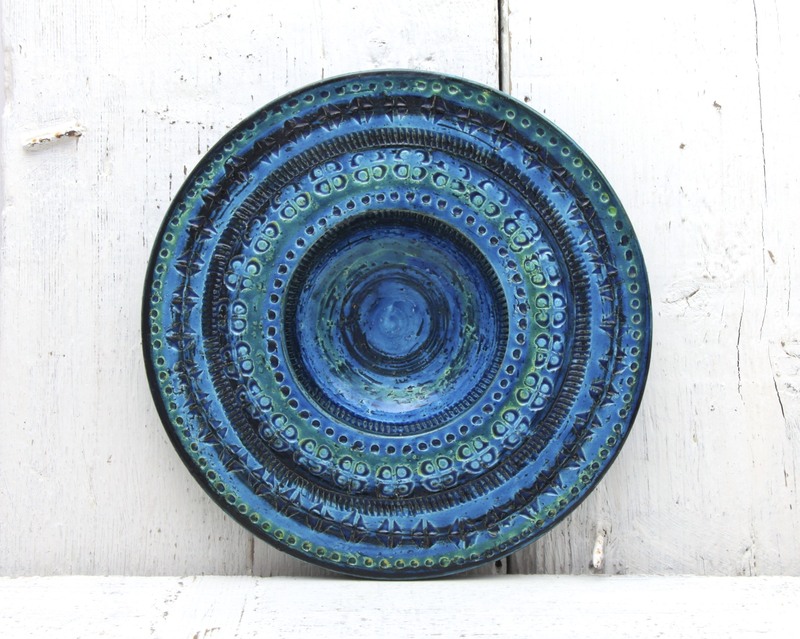 Beautiful glossy layered blue and turquoise glazes evoke the colours of the Mediterranean Sea. A Wonderful, Rare and Unusual piece from one of the greatest designers and ceramicists of the 20th century. Would look great in any 50’s, 60’s, 70’s, retro, vintage, mid century modern, modernist, minimal or contemporary interior. A Great addition to any collection of Bitossi / Italian / European art pottery or 20th century design. In Great Condition, a few small flakes of missing glaze as is common with this style of rough glazed ceramics. the hole on the base for wall hanging is probably not original, but doesn’t detract, not visible on display. Measures 21 x 21 x 2.5cm / 8.25 x 8.25 x 1in.